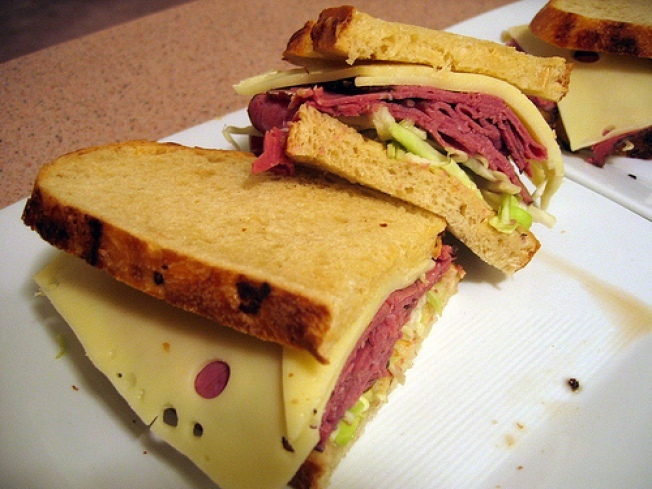 Hot pastrami sandwiches are a good way to fill your belly at a good price. If you shop at Trader Joe’s, you probably already know that one of their most (if not the most) popular breads is their cheddar and garlic sourdough bread. I’ve been buying it regularly for several years now, and I’m always looking for new sandwich fillings to keep things interesting. I ended up using my last loaf on a variation of the classic hot pastrami sandwich. Instead of rye, I used sourdough, which I prefer. Instead of coleslaw, which is a traditional filling in pastrami sandwiches, I opted for sliced cabbage, since I’m not crazy about mayonnaise. 1. Place pastrami and broth in a small saucepan. Warm over low heat, covered, stirring periodically, for about 15 minutes. 2. Spread a piece of bread with half a tablespoon of mustard . Pile 1/4 pound of the pastrami on top of the bread, then top with a slice of cheese, 1/4 cup cabbage and the second piece of bread. Cut the sandwich in half. Repeat with remaining two slices of bread and serve.